Technology education in BC schools has changed in recent years as a result of funding cuts and the removal of maximum class size numbers by government. There are fewer technology education teachers, and those remaining are teaching larger classes with less supplies, equipment, and maintenance than ever before. 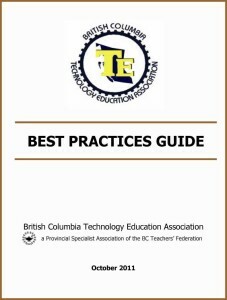 In an attempt to address the resultant problems in program quality and teaching and learning conditions, the BC Technology Education Association (BCTEA), a provincial specialist association of the BC Teachers’ Federation (BCTF), has compiled a comprehensive document outlining recognized best practices. Health and safety is an underlying theme in all sections. The Best Practices Guide has received some media coverage in various parts of the province. The BCTEA encourages all tech ed teachers in the province to present the BPG to their administrators and senior district management. Consider contacting your local media and tell your story and promote the BPG in the best interest of our students and programs.